Russia has accused Ukraine of stealing $25m of gas exports destined for Europe after it cut off supplies to the country on Sunday. Countries as far west as France say supplies from a pipeline running via Ukraine have fallen by up to 40%. Ukraine denied taking the gas, but said it would siphon off a share if temperatures fell much below freezing. The row erupted after Russia raised the price of 1,000 cubic metres of gas from $50 to $230 and Ukraine refused to pay. Russia's gas monopoly Gazprom is still charging the lower price to some former Soviet countries, though the average price in the EU is $240 (£140). Moldovan President Vladimir Voronin said his country had also been cut off, after refusing to pay $160 per 1,000 cubic metres, according to the Itar-Tass news agency. Kiev says it is being punished for its attempts to become more independent from Moscow and develop stronger ties with the West. In a statement on Sunday night, it accused Russia of resorting to "blackmail" in order to undermine the country's economy. Both the European Union and the US have expressed concern about the row. Germany, which depends on Russia for 30% of its supplies, has called on Moscow to "act responsibly". 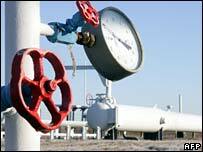 Alexander Medvedev, deputy head of Gazprom, said Ukraine had stolen 100 million cubic metres of gas on Sunday. "If the theft continues at this pace, the volume and cost of the stolen goods will rise quite considerably," he said. Ukraine's Fuel and Energy Minister Ivan Plachkov said there had been no "unauthorised diversion" of gas. But he said Ukraine had the right under existing contracts to take a share of gas exported via the Ukrainian pipeline - the main route for Russian exports - and would do so if the temperature fell below -3C. He also said that Ukraine was currently relying on gas from Turkmenistan and its own reserves. But Gazprom, which controls the pipeline linking Turkmenistan and Ukraine, said no Turkmen gas was entering the country. "Today the Ukrainian gas transporting system is receiving nothing but Russian gas," Mr Medvedev told journalists in Moscow. Gazprom supplies about one-fifth of gas consumed by the European Union. France, Italy, Austria, Hungary, Poland and Slovakia have reported a sharp fall in supplies. The shortage was being passed on, as affected countries said they would in turn be pumping less gas to customers further down the line, like Serbia and Bosnia. Experts say Germany could be affected soon. Ukraine says the loss of Russian supplies will not hit ordinary Ukrainian consumers, but has warned that industry could be affected. The Ukrainian foreign ministry says Russia is in breach of contract by cutting off the gas and has called for a resumption of talks in the presence of international experts. It says Ukraine is ready to agree to an increase in gas prices, if this is phased in gradually. Relations between Russia and Ukraine have been tense since President Viktor Yushchenko came to power last year on a promise to strengthen relations with the EU and Nato, and steer the country out of Russia's sphere of influence.